One of local people said, "They had never stopped to do this festival since 30 years because of rain. Unbelievable, right !?" My daughters and I went to the beach 10 minutes before, and the fireworks was started at 8:00 pm on time as usual. 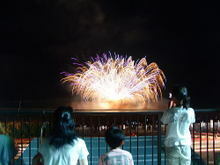 We saw and took pictures of fireworks on the 2nd floor of "Family Mart" in front of the beach. Recently we select this place because this is a one of best place to see, I think. But I recommend you another viewing location, it is "the beach". You will be able to see fireworks above your head there. 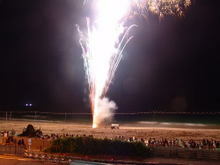 After starting fireworks more than 1,500 rockets were fired from two separate bases in the beach for 30 mitnutes. Have you ever seen the fireworks on the ocean ? 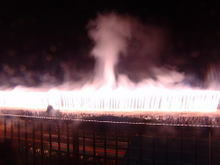 I think that you can not see these kinds of fireworks in Tokyo, for example. It is about 150 meters. Yes, this is a great spectaculor. All of spectator were clapping their hands. The final biggest fireworks were fired !! Those were really gorgious and crazy !!! Why don't you come and visit Shirahama to have this great experience next summer ? 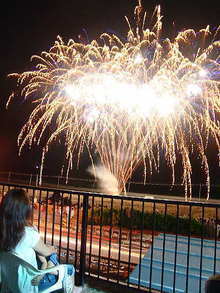 *The Japanese word of Firework "Hanabi" means fire flower. 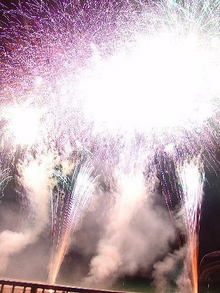 The fireworks first arrived in Japan from China, like green tea, chinese characters and silk.